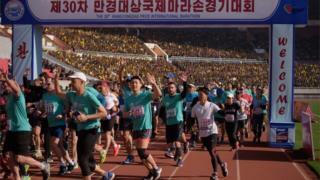 Twice the number of foreign runners took part in Sunday's marathon in the North Korean capital Pyongyang compared to last year, tour firms say. About 950 foreigners entered the annual race, up from 450 in 2018. Political tensions have eased in recent months leading to an increase in tourism, although the regime remains one of the world's most oppressive. A US travel ban to North Korea is still in place following the death of a student in 2017. Why would visitors want to run a marathon in North Korea? The marathon is part of the celebrations marking the birth of the founder of North Korea, Kim Il Sung, in 1912. Tourists run through the strictly controlled capital city, cheered on by North Koreans lining the streets. The event attracts so-called marathon chasers - tourists who run different races across the world. Jasmine Barrett, an Australian running the marathon for the third time, said she kept coming back "to see the smiles on the children's faces". "I'd definitely recommend it to others because it's a great way to see the city and the people who live there," she told AFP news agency. There were no American runners due to the tourist ban following the death of US student Otto Warmbier two years ago. He was detained in 2015 after allegedly stealing a propaganda sign. Pyongyang authorities returned the 22-year-old to the US in a coma in 2017 and he died days later. Colin Crooks, the British ambassador to North Korea, was one of the runners taking part. He tweeted that the "atmosphere in the stadium was great". What state is the US-North Korea relationship in? Tourism to the region slumped after North Korea launched a series of missiles in 2017. US President Donald Trump and North Korean leader Kim Jong-un then shared threats and insults, raising political tensions, before reaching a joint agreement at talks in June 2018. Following a failed second summit between the US and North Korean leaders in Hanoi this February, US officials have insisted that diplomacy is still "alive". But Pyongyang has warned that it could resume missile and nuclear testing. Last month, the North withdrew from an inter-Korean liaison office which was opened amid 2018's warming of ties to facilitate talks with the South.